Leaves are falling this week during our Weekly Virtual Book Club for Kids and we are reading Leaf Man by Lois Ehlert! Leaf Man is filled with snazzy leaf collages and images. Inspired by the book we decided to do a collage of color on our leaves using crayon and watercolor. 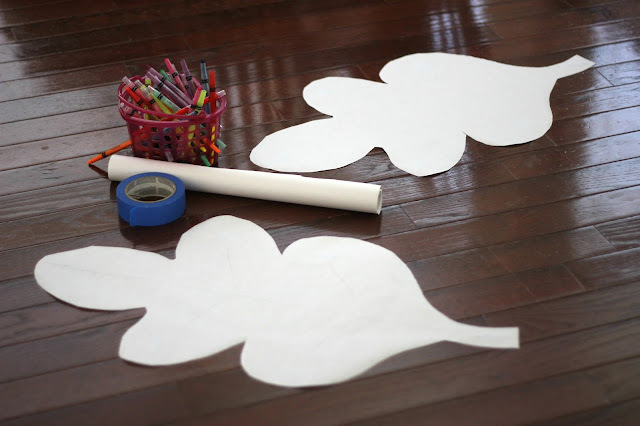 To get started I drew two large leaves onto finger printing paper (shiny side down) and then I cut them out. 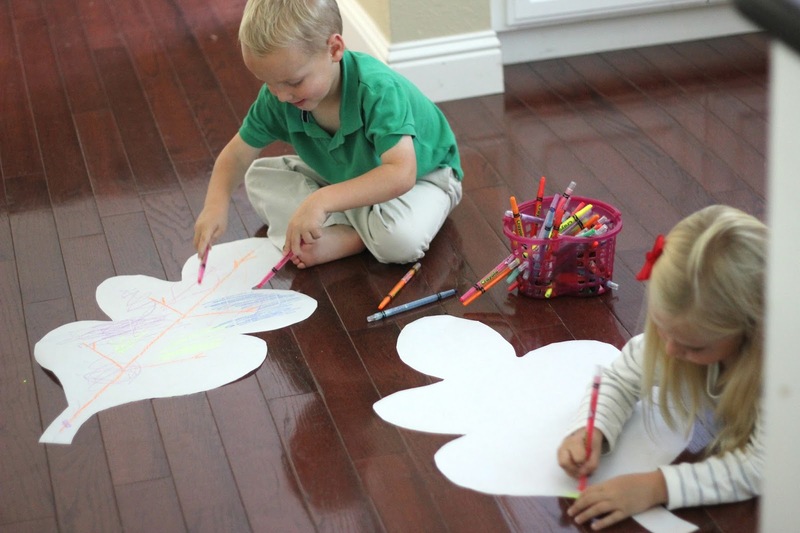 After they were cut out, I secured them to the floor with painters tape so that they wouldn't move around while we were painting and drawing. We started off by covering the leaves in crayons. I loved seeing the different patterns and visual textures that were created. 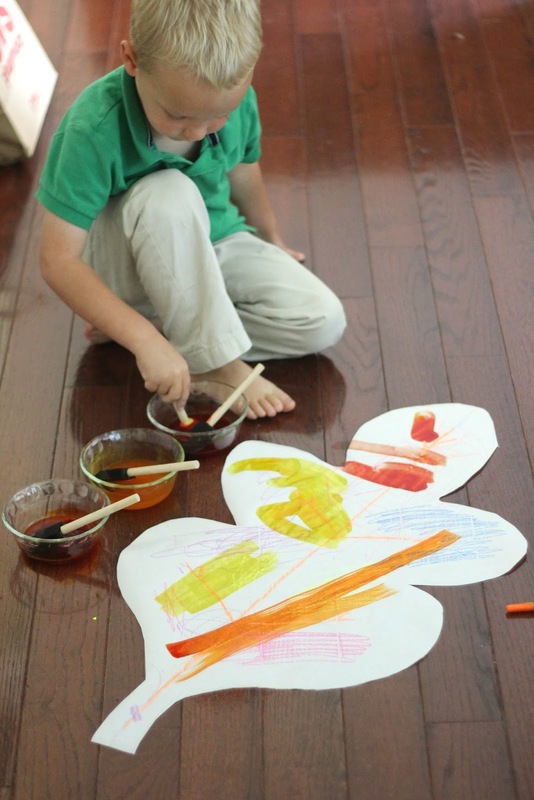 Next I got out our liquid watercolors and diluted them a bit and then we began painting our leaves. It was fun to watch the reaction between the watercolor and the crayons. 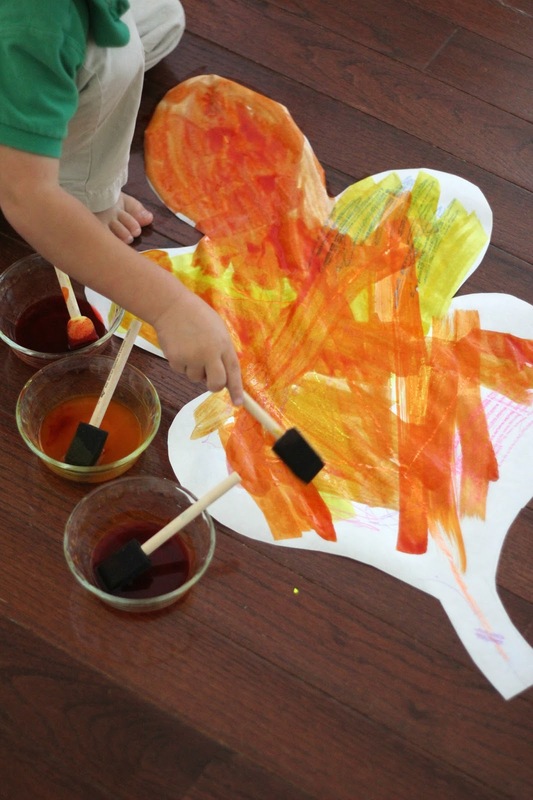 Once the leaves were covered in colors, we laid them out to dry and we read Leaf Man by Lois Ehlert! The leaves were gorgeous anywhere we put them and it was fun to see how they changed colors in the light. 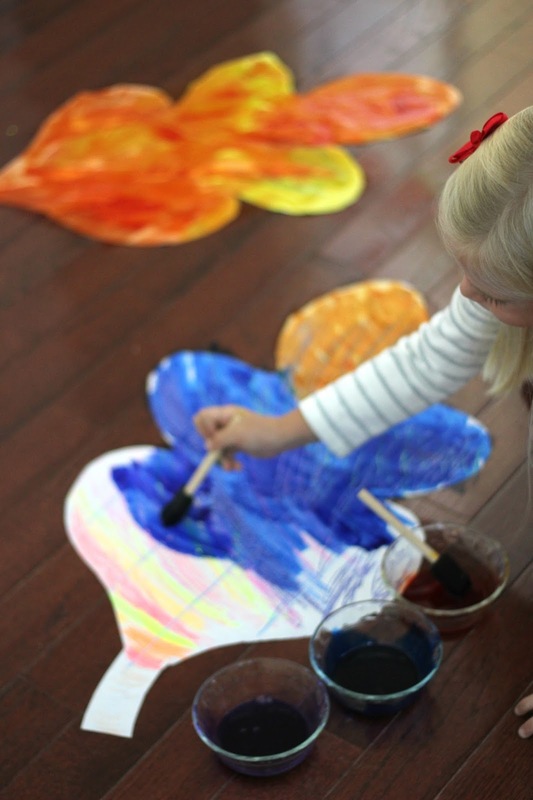 I especially loved the contrast between the yellow crayon and the bright blue on my daughter's leaf. We loved mixing the colors and trying to figure out which colors made what. The end results were beautiful! 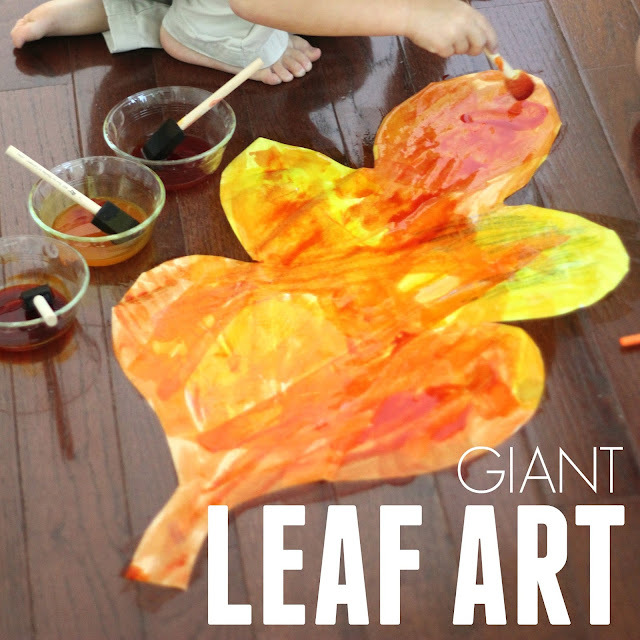 Have you ever tried making leaves "giant-sized"? Have you done any crayon resist recently? 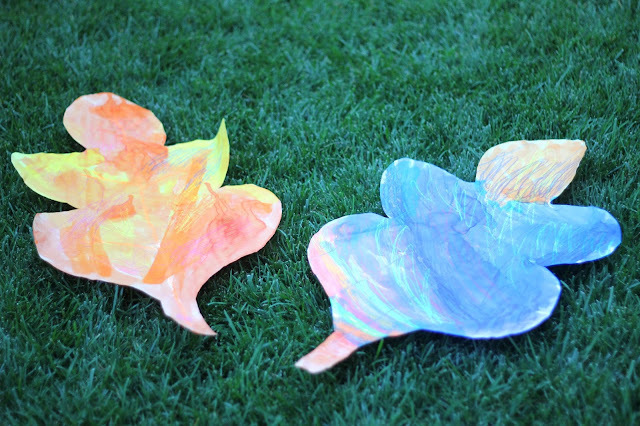 This project was not only fun and colorful, but the kids took great ownership of how their leaves turned out! 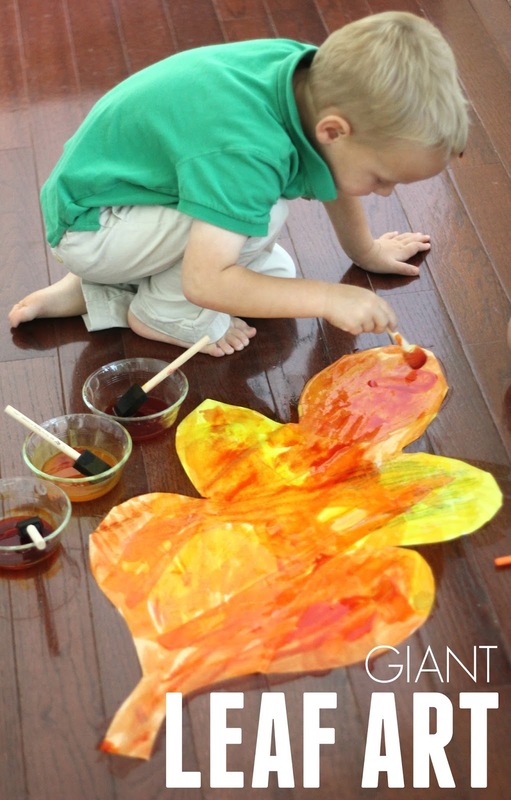 Do you have a favorite leaf themed book or activity? Come tell us about it! My kids will LOVE this activity! These giant leaves would look great in a big picture window! 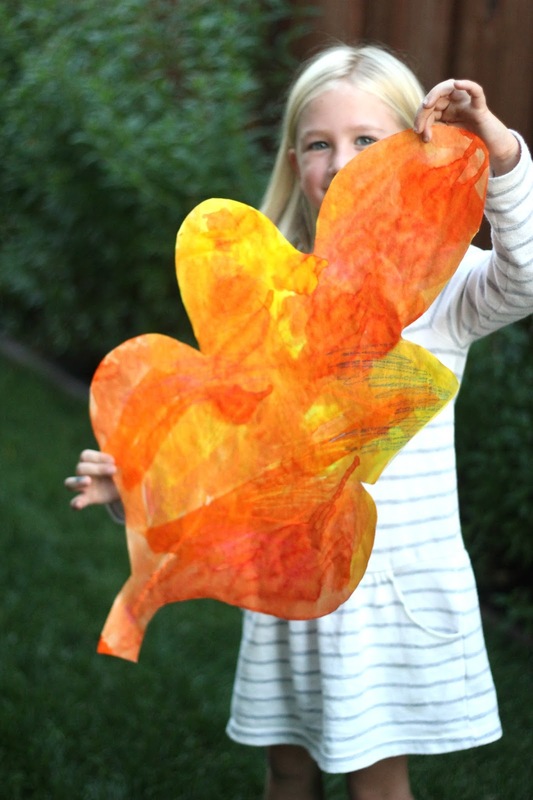 My kids love any art work on a large scale....not sure if I tried to cut out a giant leaf it would actually look like a leaf though. Love the colours autumn is so beautiful.